Inspire with the latest generation of automated campaigns! The data protection compliant Evalanche Suite (made in Germany) combines the best of both worlds. It offers marketing and sales a flexible and powerful solution - from e-mail marketing to marketing automation to lead management - all combined in one of the most modern systems in Europe. The Best of Breed solution offers companies effective ways to automate business processes and market development. Generate more leads with Evalanche, develop them automatically, bring them to sales readiness and transform new customers into loyal existing customers. Evalanche helps companies and agencies to serve different channels in different languages and to advance the digital transformation in their business. The application is the ideal solution if you want to implement your lead generation and your account-based marketing in compliance with EU DSGVO and take it to a new level. Thanks to numerous technical innovations, an extensive range of functions and various interfaces, you can expand Evalanche into a tailor-made suite. With our solution you react agilely to the constantly increasing speed of innovation and achieve maximum efficiency. Clear graphical reports, self-explanatory icons and intuitive use of the system increase efficiency and make working with Evalanche even easier. In addition, you will receive concrete practical tips, user-friendly documentation and step-by-step instructions on the individual functions and features of the software. And with expert tips on data protection and data management, you are always well informed and can generate and develop leads in compliance with the law, turn them into customers and expand your existing customer business. With the email marketing solution in Evalanche you are in the best position if you want to send professional newsletters and emailings to customers, prospective customers and business partners - worldwide. Our email marketing solution can be quickly integrated into your existing IT infrastructure and offers you automated data synchronization with Salesforce CRM, SAP CRM, MS Dynamics, Sugar CRM and many more. Due to the SaaS solution, the software is quick and easy to use - so that you can start successfully with your email marketing immediately with attractive and flexible price models. Take advantage of our newsletter starter set if you want to get started immediately. 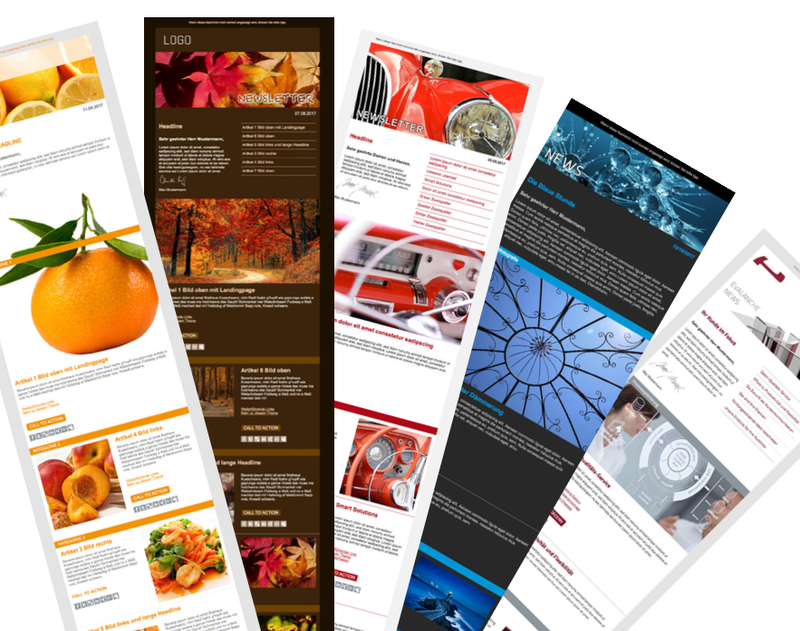 Define the color values and font of your corporate design and insert your company logo. 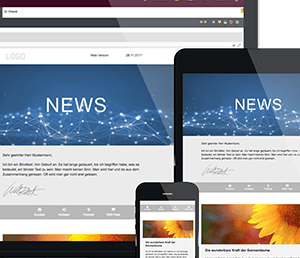 You will instantly have a newsletter template adapted to your Sytleguide - and you can start creating your first cross-media eMailing. 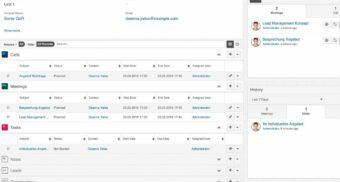 With the comfortable web interface, web editors can easily create cross-media and complex emails and newsletters without programming effort. 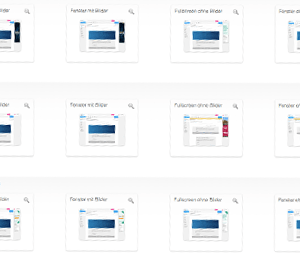 The user interface works via drag&drop so that you can easily and quickly integrate text and images. Our quality checks also include: attention, reading time and text analysis, spam checker, dispatch time optimization, inbox monitoring and more. This is part of our way of ensuring that the deliverability of your emails is as successful as possible. Lead nurturing includes all measures taken by a company to address a prospective customer with relevant information at the right time. For this, it is important to choose a mode of address suited to the phase of the purchase decision that the prospective customer is currently in. Evalanche develops activity and profile-based flows to regularly and automatically provide your leads with relevant content. Get to Know Evalanche's Email Marketing Solution Now! With the marketing automation solution, you raise your email marketing to a new level. Design the customer experience with Evalanche – accompany your prospective customers throughout the customer journey and also automate customer lifetime value. Thanks to personal tracking and evaluation of click behaviour, you can analyse the needs of your prospective customers and automatically start personalised email marketing campaigns. With Evalanche you can design your communication with prospective customers to be individual, personalised and efficient – and with the right timing. Via highly-personalised campaign components (ad emails, marketing automation measures, website personalisation in real-time through personalised lead pages and much more), you increase relevance for prospective customers and existing customers and you gain the trust of your recipients. This way you not only get promising leads – you also support cross-selling and upselling. The Campaign Designer is available both in the marketing automation solution and in the lead management application. It thus creates a connection between automated communication with existing customers, the generation of new leads and conversion of the latter into loyal customers. The Campaign Designer allows you to automate the entire customer experience. Easily create multilevel campaigns. Define the start and end points of your campaign, the durations, dependencies and conditions, and automate your communication. The Evalanche Campaign Designer combines business process management methods with the flexibility of Evalanche object configuration for everything to do with a recipient's profile. 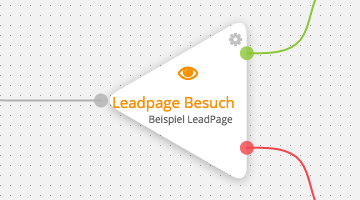 The "Visited Lead Page" node in Campaign Designer in Evalanche gives you the option to check whether a profile has visited the Lead Page. Using this activity as a base, you can continue to edit the profile in your campaign accordingly. 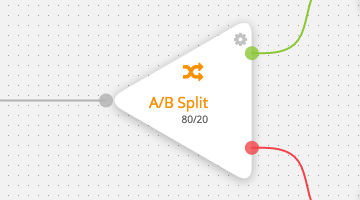 The A/B Split distributes running profiles along two routes – and the A/B ratio can be adjusted individually. This allows you to model different scenarios such as sweepstakes, representative surveys, or simple test scenarios. One way in which this can be used is to define a perimeter around an event or trade fair venue. You can then address your communications to the profiles within your defined radius. The perimeter and coordinates can be individually adjusted. 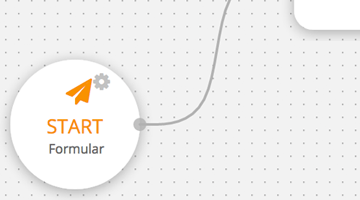 With the "Start Form" start point in Campaign Designer, you can easily define a profile to be automatically transferred to the campaign after the completed form has been submitted. 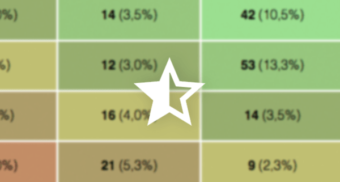 The profiles start the campaigns dynamically as soon as they match a given definition. In the future, you will no longer be forced to import a target group if you want to start a campaign. 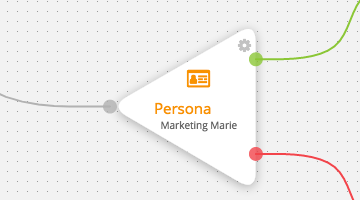 The new Persona node checks whether a profile matches your defined persona. Based on this insight, new points in the campaign can be defined. With Campaign Designer, you have the option to redirect profiles of a defined persona and to respond highly individually to each customer journey. For particularly large and/or highly varied campaigns, you have as of Q1 2018 the option of copying profiles from one campaign to another. 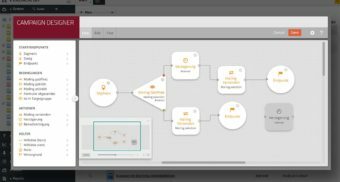 This allows you to modularise complex scenarios and to integrate them into one or more additional campaigns quite easily. Get to Know Evalanche's Marketing Automation Solution Now! 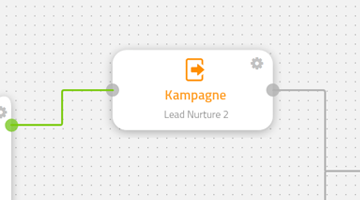 The lead management application in Evalanche includes areas for lead nurturing, lead scoring and lead routing. It also offers comprehensive options such as lead generation through content marketing, use of persona objects, targeted scoring and complex lead-management campaigns. This way, lead pages and web forms in Evalanche allow you to generate new addresses that evolve leads with nurture paths, profile and activity scoring in Campaign Manager, delivering them in a market-ready form. Thanks to the extensive amounts of information you receive about your lead during the nurturing process, you can then address your lead with the greatest possible personalisation and relevance and convert them into an enthusiastic customer. Linking up to this, you have many options in Campaign Designer for setting up additional cross-sell and upsell campaigns and increasing customer lifetime value. The Persona object allows you to manage your individual persona definitions in the system and to use them in a variety of places. You have the option of defining various properties for your persona and to give points for these properties. Based on the automated assignment of your profiles, you can start campaigns, personalise content or send mails only to the persona that you define. With the new Persona object, you have much more flexibility and a more detailed selection than with target groups. The purpose of lead pages is to efficiently generate leads in the context of lead management campaigns or marketing automation scenarios. With Evalanche, you generate highly optimised landing pages that adapt to the device (mobile/desktop) and user profile in real time and display all the content in an individualised and personalised manner. The trust required for long-term customer loyalty is created through continuously refined customised communication with highly relevant topics. We support you in building profiles with user-friendly web forms, high-performing modular links to CRM and shop systems, and meaningful analysis tools. Convert potential customers into loyal customers with Evalanche. A key element of an integrated lead management is the evaluation of leads – i.e. lead scoring. Evalanche now supports you with all the standard explicit and implicit lead scoring information such as profile scoring, activity scoring and content scoring, across the entire lead management process through to the mapping of lead classification data. 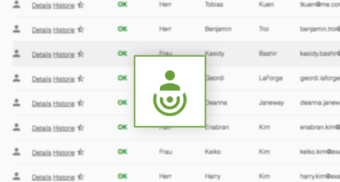 Additionally, if required, you can flexibly and conveniently connect external systems via Webservice to determine scoring information. Lead routing refers to the transfer of leads from marketing to sales, directly to the employee that will be responsible for the respective lead. Transfer the qualified leads to your sales department via an automated process. Sales staff are informed via email when they are assigned new leads. 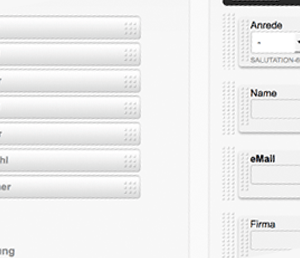 Leads are assigned to the right contact person and can thus be contacted directly. Get to Know Evalanche's Lead Management Solution Now! Among the key features of Evalanche are its excellent data protection and its data security, which has been certified by TÜV Süd and TÜV Hessen. These awards are very important to us, so we have the software recertified annually through new audits. This is because we want to ensure that your data and your customers' data are always secured in the best possible way and that you are already prepared for EU-DSGVO. SC-Networks has been certified for ISO/IEC 27001:2013 by TÜV Hessen. The certification, based on the leading international standard for information security management systems, demonstrates compliance with the highest IT security standards throughout the company. Evalanche offers you the best technical conditions for legally compliant implementation of the new EU-GDPR regulations. We offer you a comprehensive data protection package. Here you will find the key information about the storage, processing and deletion of personal data in addition to the certification proofs, pentest audits, etc. With Evalanche, you not only have a technical solution for legally compliant marketing – you also get practical tips for implementing them in the right way. With Evalanche you have profile-accurate control of consent to and refusal of personal data collection. As a result, you have the technical means to collect data in a way that is legally compliant with EU-DSGVO. A best-of-breed solution is only as good as its linkability to third-party systems. This is why our developers, together with our partners, have developed numerous connectors, middleware solutions and APIs for common CRM, CMS and analysis tools. This allows you, when working in combination with other products, to exchange personal data in a legally compliant way and exchange product data in-time. Thus you can easily connect Evalanche to your company's own data sets and synchronize them accurately and in real-time. Our powerful connectors provide optimal synchronisation of campaigns and address data, hard bounces, statistics and unsubscriptions. Via our configurable connectors and secured web services, data can be exchanged securely over a wide variety of applications. As a powerful alternative to our connectors, we offer (as just a few examples) adapter hubs and the Evalanche Integration Suite as middleware solutions. These allow you to configure the middleware solution according to your individual needs and thus to connect Evalanche to a third-party system. We offer connections to template APIs, SOAP APIs, report APIs and much more. These connections allow you to easily and individually program your system requirements. 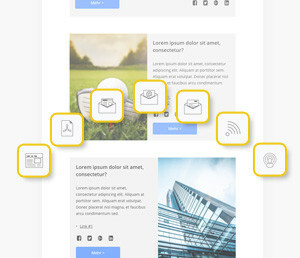 With our interfaces you can connect your software individually to your desired systems. Through them, profile data, content syndication, campaign information, template scenarios, analytics data, etc. can be exchanged and synchronised. 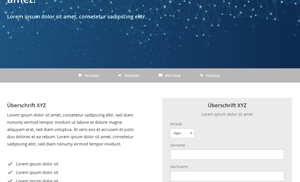 Information on all available interfaces – Get to know the possibilities! Become an expert in Evalanche email marketing, lead management and marketing automation with our new e-learning platform. As of 2018, we want to offer you more than just one of the most technically up-to-date solutions with Evalanche. We also want to pass on tangible best-practice tips, step-by-step instructions and information on specialist data-protection knowledge. The expertise gained can also be certified after self-study. 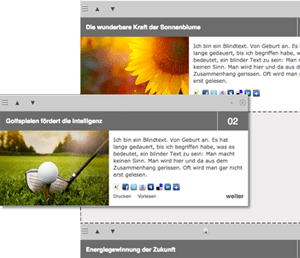 In Evalanche you now have the possibility to translate articles completely and automatically into up to seven languages - German, English, French, Spanish, Italian, Dutch and Polish. Need more information about Evalanche? Use our media set!